The former residents believe that the process has fallen apart, with bank bosses indicating last week they would seek their own solutions for mortgage-holders. 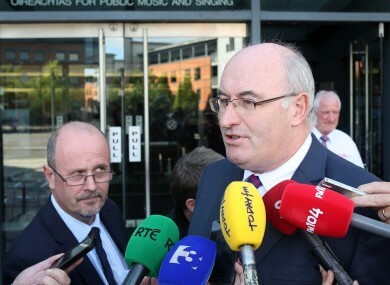 ENVIRONMENT MINISTER PHIL Hogan has said he is not aware whether a process set up to reach a resolution between all of the stakeholders in Priory Hall has broken down. That’s despite reports in yesterday’s Sunday Business Post that the process collapsed a month ago, after the retired judge heading it up ended his involvement. Additionally, residents told TheJournal.ie at the weekend that bank officials’ answers to the Oireachas Finance Committee had prompted “massive worry” amongst the group. Senior AIB executives told the TDs and Senators “we are not going to wait for the process” and that they would try and resolve the issue “outside of a process that cannot seem to move”. Permanent TSB said they would pursue a similar course of action, while Ulster Bank said they would review each customer’s position “on a case-by-case basis”. Residents’ spokesperson Graham Usher said the answers had prompted huge concern, and that people were “quite panicked” as it indicated the mediation process was at an end. Judge Finnegan was to report to the court. I have not seen anything from Judge Finnegan, he has to report to the court and I understand the date of that reporting is on the 15th of October. Minister Hogan added that whatever course of action was decided at the conclusion on the court proceedings, he was “determined to act on behalf of the residents”. Speaking last week, Hogan said that the Donaghmede complex, which was evacuated nearly two years ago due to fire safety concerns, may have to be demolished. Residents have made repeated calls for a meeting with the Minister to address the issue since they were forced to move from their homes — however, Hogan has maintained he cannot step in until the court process is at an end. Explainer: What is happening with Priory Hall? Email “Hogan still expecting report on Priory Hall, despite reports mediation has collapsed”. Feedback on “Hogan still expecting report on Priory Hall, despite reports mediation has collapsed”.